High Lifter?s 2? Lift Kit. 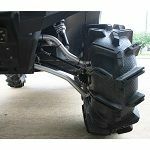 ?Increase your ground clearance and make room for larger tires to dig deep and ride hard in most any terrain. 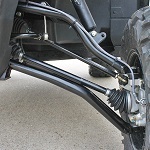 The Max Clearance Front Forward Upper & Lower Control Arms move the front hubs forward?1.5 inches for clearance without lifting the ride or increasing the center of gravity.